The Man Who Wasn’t There? He reinstituted the value of inclusive growth and governance open to scrutiny. He institutionalised the voice of civil society. The CPI(M) chief shares his version of events in the Manmohan years and what the future may hold. Pakistan waited. 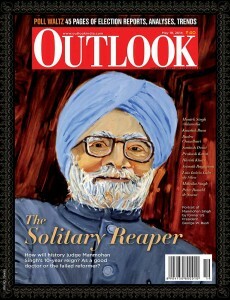 And Manmohan kept it waiting. Where Does The Purification Begin? In eastern UP, it’s Modi alone carrying the saffron campaign. Can his ‘development’ mantra breach the hinterland? Can RG’s yuva choice Lalitesh Tripathi make it a double, win LS poll? Bye, bye secular democracy, hello ‘ethnic democracy’? Prakash Jha had taken a break from politics. But he’s back again. Barasat is scorched by a crime wave. P.C. Sorcar plans a vanishing. Is it time for India to vote online? The pros and cons abound. Narendrabhai would have a much stronger fight on his hands if he faced a more coherent opposition. Despite all the good intentions, the film wallows in its goodness and left me cold by its sheer virtue. Rather than taking you by surprise, the film flounders in its own dre­ariness and mediocrity.